I was never alone. My community was my strength. You are here: Home / I was never alone. My community was my strength. 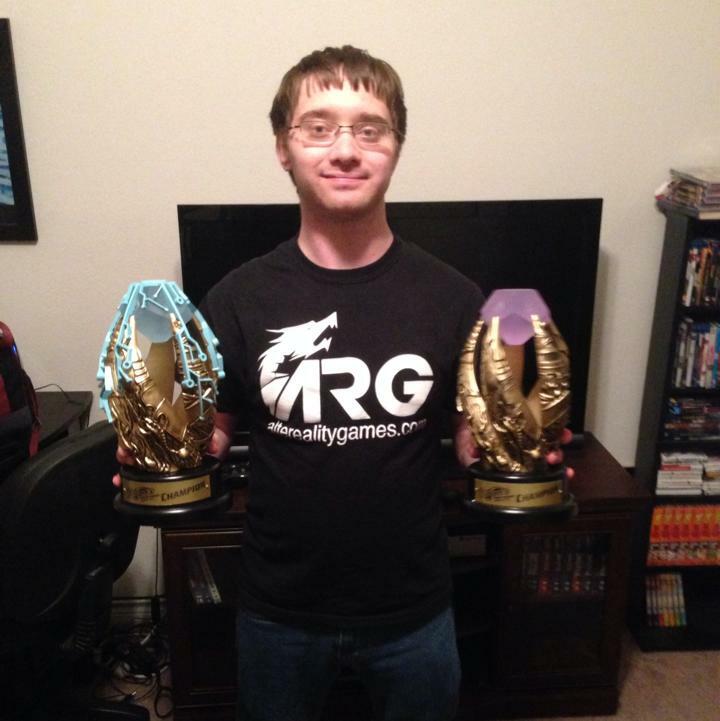 Two years ago, I was a mediocre Yugioh player forever to be walking in my brother’s shadow. I am not sure why I played because I felt no enjoyment out of it. Then some old friends of mine said that they were rebooting Duel Masters into a game called Kaijudo. I never played Duel Masters when it was around but I figured I would give Kaijudo a shot. The first time I played it was so much fun I never wanted to stop. Very few card games have I played where I can lose and still have a good time. I am going to go through and touch on my whole Kaijudo journey, if you could care less, you can skip to the last paragraph. I was pretty terrible at Kaijudo at first, but it did not stop me from wanting to play more. All we had to play with for the longest time was the Tatsurion vs. Razorkinder decks until Dojo Edition was finally released and we got access to more cards. There was no organized play, but that did not stop us from dueling and just having fun. I started playing Kaijudo because it was fun and I am going to finish Kaijudo because it is fun. Flash forward to when Evo Fury was released, I have gotten pretty decent at the game, I learned the strategy of different decks, but still did not win that often. One day Robby Stewart and I were playtesting at a Whataburger. He made this new control deck that used Cobalt, the Storm Knight, a card most people never glanced at because everyone was focused on Emperor Neuron. This deck almost seemed unbeatable. We stayed up at that Whataburger until 4 in the morning playing the mirror match and tweaking and working on the deck to make it best as possible. Robby got so mad at me because a couple of times that night I had all 3 Terror Pits in my shields. There was still no Organized Play at this time, but we took that deck to many Win-a-box tournaments and either won them or we were in the finals. Organized play was finally announced and the prize support blew me away, because coming from Yugioh all you got from making top 8 was a playmat. The fact that first got a free flight was amazing. I played in one of the first KMC’s at Comic Asylum making it to top 4 with my crazy 5-civ Dragon control deck. I am still not quite sure how I did so well with it, I guess I just wished really hard and my dream came true. I lost to Joe Bass, who I would later view as one of the best Kaijudo players. Then a lot of us got in a van and drove all the way to Kansas and Missouri to play in KMC’s. I was able to get my invite with Ryan Bishop in Kansas. Robby Stewart and Sammy Huda got their invite the next day in Missouri. We were all ready to play in Seattle. The first Kaijudo Championship was spectacular, mainly because we had no idea what to expect. There was food provided for us all weekend, got to sit down with all of the R&D who worked on the game, and even design two cards that would come out later. I walked up to Ryan Miller and Chuck Arnet on Saturday, before the tournament even started, and told them that this has been the best tournament experience I have ever had. I did not even care how I did in the tournament, I was already having the time of my life. All I did the next day in the tournament is play my cards the best way I knew and I was able to become the first Kaijudo Champion. Not only that, but I met my friend Robby Stewart in the finals. The same friend that began my competitive path at Whataburger until 4 in the morning a long time ago. I felt like there was nothing more I could achieve in the game. There is no other word I have for that Championship other than perfect. I was invited back to play in the Winter Championship later that year for winning the Summer Championship. It was pretty convenient because it was held 40 minutes away from my house. This one was even better than the last. There was the prize wall and live streaming. It was nice just seeing everyone again. We were able to play Booster Brawl, a product that would not be out for a few months and sit down and play against R&D before the tournament on Sunday. I did not have that high of expectations for this tournament because I try my best to keep the mind set of just having fun. It wasn’t until I made top 8 that I thought “What if I can do this again?” All you can do is play the game to the best of your ability and as long as you do that, you have nothing to be ashamed of. That is what I did and was able to win my 2nd Championship in a row. I try not to have an ego about any of this, when people ask, “So are you the best Kaijudo player?” I say no, I just play the game I love. For winning the first Kaijudo Championship, I was awarded the prize of naming of my own Kaijudo card. I emailed with Drew Nolosco for about 2 weeks working on the name of the card. This is probably one of my favorite memories about Kaijudo. I can always look back and see that I had the privilege to leave a mark on the game. Pakidamo the Resilient. He represents how strong the Kaijudo Community is and how they do not give up even though others may push the game a side. The 3rd Championship was different than the others because it was 9 rounds with 3 rounds of draft. In order to help practice for draft I played in 4 draft side events on Friday. I won 2 of them, lost in the finals in another, and then in top 4 of the last one. I was pretty content with my draft skills. So I ended going 1-2 in draft for the tournament. In order to make top 8 I had to win all 6 rounds of constructed. I went 5-0 in constructed and lost the last round to L/F rush. I was a little bummed, but I had a great time playing and knew it was not all about winning, but having fun. I will be at the last Championship in Rhode Island in October whether I have an invite or not. You always have to finish what you start. It is strange saying “Oh it’s just a game, you can move on to another one.” You may call me a nerd or obsessed, but Kaijudo was more than a game. It was a release from the real world. A time for people to just have a “good time” (I am winking at you Rob Gruber). The player base was small, but had more heart than any other game I have ever seen. They look out for each other and will never turn away people. There were no excuses, no enemies, no fear, no dishonesty. I was never alone. My community was my strength. I played a little bit and, wow. The community was so fantastic. Our area is planning on keeping it alive with a draft cube. Nicely put Bobby. We who played will always love this game. Good luck at the final championship!